Interest is payment from a borrower or deposit-taking financial institution to a lender or depositor of an amount above repayment of the principal sum (i.e., the amount borrowed), at a particular rate. It is distinct from a fee which the borrower may pay the lender or some third party. It is also distinct from dividend which is paid by a company to its shareholders (owners) from its profit or reserve, but not at a particular rate decided beforehand, rather on a pro rata basis as a share in the reward gained by risk taking entrepreneurs when the revenue earned exceeds the total costs. The rate of interest is equal to the interest amount paid or received over a particular period divided by the principal sum borrowed or lent (usually expressed as a percentage). According to historian Paul Johnson, the lending of "food money" was commonplace in Middle Eastern civilizations as early as 5000 BC. The argument that acquired seeds and animals could reproduce themselves was used to justify interest, but ancient Jewish religious prohibitions against usury (נשך NeSheKh) represented a "different view". The first written evidence of compound interest dates roughly 2400 BC. The annual interest rate was roughly 20%. Compound interest was necessary for the development of agriculture and important for urbanization. While the traditional Middle Eastern views on interest was the result of the urbanized, economically developed character of the societies that produced them, the new Jewish prohibition on interest showed a pastoral, tribal influence. In the early 2nd millennium BC, since silver used in exchange for livestock or grain could not multiply of its own, the Laws of Eshnunna instituted a legal interest rate, specifically on deposits of dowry. Early Muslims called this riba, translated today as the charging of interest. Simple interest is calculated only on the principal amount, or on that portion of the principal amount that remains. It excludes the effect of compounding. Simple interest can be applied over a time period other than a year, e.g., every month. Compare for example a bond paying 6 percent biannually (i.e., coupons of 3 percent twice a year) with a certificate of deposit (GIC) which pays 6 percent interest once a year. The total interest payment is $6 per $100 par value in both cases, but the holder of the biannual bond receives half the $6 per year after only 6 months (time preference), and so has the opportunity to reinvest the first $3 coupon payment after the first 6 months, and earn additional interest. To approximate how long it takes for money to double at a given interest rate, i.e., for accumulated compound interest to reach or exceed the initial deposit, divide 72 by the percentage interest rate. For example, compounding at an annual interest rate of 6 percent, it will take 72/6 = 12 years for the money to double. 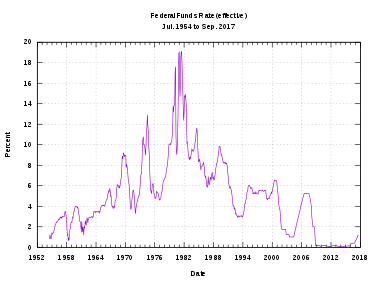 However interest rates are set by the market, and it happens frequently that they are insufficient to compensate for inflation: for example at times of high inflation during, e.g., the oil crisis; and currently (2011) when real yields on many inflation-linked government stocks are negative. Interest rates are generally determined by the market, but government intervention - usually by a central bank - may strongly influence short-term interest rates, and is one of the main tools of monetary policy. The central bank offers to borrow (or lend) large quantities of money at a rate which they determine (sometimes this is money that they have created ex nihilo, i.e., printed) which has a major influence on supply and demand and hence on market interest rates. Aristotle and the Scholastics held that it was unjust to claim payment except in compensation for one’s own efforts and sacrifices, and that since money is by its nature sterile, there is no loss in being temporarily separated from it. Compensation for risk or for the trouble of setting up a loan was not necessarily impermissible on these grounds. Nicholas Barbon (c.1640–c.1698) described as a “mistake” the view that interest is a monetary value, arguing that because money is typically borrowed to buy assets (goods and stock), the interest that is charged on a loan is a type of rent – “a payment for the use of goods”. According to Schumpeter, Barbon’s theories were forgotten until similar views were put forward by Joseph Massie in 1750. In 1752 David Hume published his essay “Of money” which relates interest to the “demand for borrowing”, the “riches available to supply that demand” and the “profits arising from commerce”. Schumpeter considered Hume’s theory superior to that of Ricardo and Mill, but the reference to profits concentrates to a surprising degree on ‘commerce’ rather than on industry. ... share their profits with capitalists who supply the funds (Réflexions, LXXI). The share that goes to the latter is determined like all other prices (LXXV) by the play of supply and demand amongst borrowers and lenders, so that the analysis is from the outset firmly planted in the general theory of prices. The classical theory was the work of a number of authors, including Turgot, Ricardo, Mountifort Longfield, J. S. Mill, and Irving Fisher. It was strongly criticised by Keynes whose remarks nonetheless made a positive contribution to it. Mill’s theory is set out the chapter “Of the rate of interest” in his “Principles of political economy”. He says that the interest rate adjusts to maintain equilibrium between the demands for lending and borrowing. Individuals lend in order to defer consumption or for the sake of the greater quantity they will be able to consume at a later date owing to interest earned. They borrow in order to anticipate consumption (whose relative desirability is reflected by the time value of money), but entrepreneurs also borrow to fund investment and governments borrow for their own reasons. The three sources of demand compete for loans. Ricardo’s and Mill’s ‘profit’ is made more precise by the concept of the marginal efficiency of capital (the expression, though not the concept, is due to Keynes), which may be defined as the annual revenue which will be yielded by an extra increment of capital as a proportion of its cost. So the interest rate r  in equilibrium will be equal to the marginal efficiency of capital r'. Rather than work with r  and r'  as separate variables, we can assume that they are equal and let the single variable r  denote their common value. The investment schedule i (r ) shows how much investment is possible with a return of at least r. In a stationary economy it is likely to resemble the blue curve in the diagram, with a step shape arising from the assumption that opportunities to invest with yields greater than r̂  have been largely exhausted while there is untapped scope to invest with a lower return. The solid red curve in the diagram shows the desired level of saving s  as a function of r  for the current income ŷ. Saving is the excess of deferred over anticipated consumption, and its dependence on income is much as described by Keynes (see The General Theory), but in classical theory definitely an increasing function of r . (The dependence of s  on income y  was not relevant to classical concerns prior to the development of theories of unemployment.) 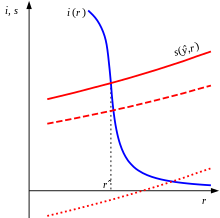 The rate of interest is given by the intersection of the solid red saving curve with the blue investment schedule. But so long as the investment schedule is almost vertical, a change in income (leading in extreme cases to the broken red saving curve) will make little difference to the interest rate. In some cases the analysis will be less simple. The introduction of a new technique, leading to demand for new forms of capital, will shift the step to the right and reduce its steepness. Or a sudden increase in the desire to anticipate consumption (perhaps through military spending in time of war) will absorb most available loans; the interest rate will increase and investment will be reduced to the amount whose return exceeds it. This is illustrated by the dotted red saving curve. In the case of extraordinary spending in time of war the government may wish to borrow more than the public would be willing to lend at a normal interest rate. If the dotted red curve started negative and showed no tendency to increase with r, then the government would be trying to buy what the public was unwilling to sell at any price. Keynes mentions this possibility as a point “which might, perhaps, have warned the classical school that something was wrong” (p.182). He also remarks (on the same page) that the classical theory doesn’t explain the usual supposition that “an increase in the quantity of money has a tendency to reduce the rate of interest, at any rate in the first instance”. the functions used by classical theory... do not furnish material for a theory of the rate of interest; but they could be used to tell us... what the rate of interest will have to be, if the level of employment [which determines income] is maintained at a given figure. the ‘marginal efficiency of capital’ partly depends on the scale of current investment, and we must already know the rate of interest before we can calculate what this scale will be. The classical theory of interest explains it as the capitalist’s share of business profits, but the pre-marginalist authors were unable to reconcile these profits with the labor theory of value (excluding Longfield, who was essentially a marginalist). Their responses often had a moral tone: Ricardo and Marx viewed profits as exploitation, and McCulloch’s productivity theory justified profits by portraying capital equipment as an embodiment of accumulated labor. The theory that interest is a payment for abstinence is attributed to Nassau Senior, and according to Schumpeter was intended neutrally, but it can easily be understood as making a moral claim and was sharply criticised by Marx and Lassalle. Knut Wicksell published his “Interest and Prices” in 1898, elaborating a comprehensive theory of economic crises based upon a distinction between natural and nominal interest rates. Wicksell's contribution, in fact, was twofold. First he separated the monetary rate of interest from the hypothetical “natural” rate that would have resulted from equilibrium of capital supply and demand in a barter economy, and he assumed that as a result of the presence of money alone, the effective market rate could fail to correspond to this ideal rate in actuality. Next he supposed that through the mechanism of credit, the rate of interest had an influence on prices; that a rise of the monetary rate above the "natural" level produced a fall, and a decline below that level a rise, in prices. But Wicksell went on to conclude that if the natural rate coincided with the monetary rate, stability of prices would follow. In the 1930s Wicksell’s approach was refined by Bertil Ohlin and Dennis Robertson and became known as the loanable funds theory. Eugen Böhm von Bawerk and other members of the Austrian School also put forward notable theories of the interest rate. The interest rate, being one of the many elements of the general system of equilibrium, was, of course, simultaneously determined with all of them so that there was no point at all in looking for any particular element that ‘caused’ interest. Even if Pareto was right, the equations might have a structure which made it possible to say more about interest than that it satisfies a complicated set of conditions. Interest is one of the main components of the economic theories developed in Keynes’s 1936 General theory of employment, interest, and money. In his initial account of liquidity preference (the demand for money) in Chapter 13, this demand is solely a function of the interest rate; and since the supply is given and equilibrium is assumed, the interest rate is determined by the money supply. In his later account (Chapter 15), interest cannot be separated from other economic variables and needs to be analysed together with them. See The General Theory for details. Leviticus 25:36— Take thou no interest of him or increase; but fear thy God; that thy brother may live with thee. Leviticus 25:37— Thou shalt not give him thy money upon interest, nor give him thy victuals for increase. Deuteronomy 23:20 (19)—Thou shalt not lend upon interest to thy brother: interest of money, interest of victuals, interest of any thing that is lent upon interest. Ezekiel 18:17—that hath withdrawn his hand from the poor, that hath not received interest nor increase, hath executed Mine ordinances, hath walked in My statutes; he shall not die for the iniquity of his father, he shall surely live. Psalm 15:5—He that putteth not out his money on interest, nor taketh a bribe against the innocent. He that doeth these things shall never be moved. 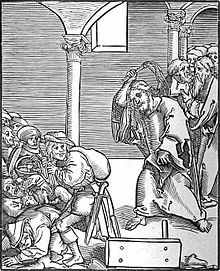 Several historical rulings in Jewish law have mitigated the allowances for usury toward non-Jews. For instance, the 15th-century commentator Rabbi Isaac Abrabanel specified that the rubric for allowing interest does not apply to Christians or Muslims, because their faith systems have a common ethical basis originating from Judaism. The medieval commentator Rabbi David Kimchi extended this principle to non-Jews who show consideration for Jews, saying they should be treated with the same consideration when they borrow. The first of the scholastic Christian theologians, Saint Anselm of Canterbury, led the shift in thought that labeled charging interest the same as theft. Previously usury had been seen as a lack of charity. St. Thomas Aquinas, the leading scholastic theologian of the Roman Catholic Church, argued charging of interest is wrong because it amounts to "double charging", charging for both the thing and the use of the thing. Aquinas said this would be morally wrong in the same way as if one sold a bottle of wine, charged for the bottle of wine, and then charged for the person using the wine to actually drink it. Similarly, one cannot charge for a piece of cake and for the eating of the piece of cake. Yet this, said Aquinas, is what usury does. Money is a medium of exchange, and is used up when it is spent. To charge for the money and for its use (by spending) is therefore to charge for the money twice. It is also to sell time since the usurer charges, in effect, for the time that the money is in the hands of the borrower. Time, however, is not a commodity that anyone can charge. In condemning usury Aquinas was much influenced by the recently rediscovered philosophical writings of Aristotle and his desire to assimilate Greek philosophy with Christian theology. Aquinas argued that in the case of usury, as in other aspects of Christian revelation, Christian doctrine is reinforced by Aristotelian natural law rationalism. Aristotle's argument is that interest is unnatural, since money, as a sterile element, cannot naturally reproduce itself. Thus, usury conflicts with natural law just as it offends Christian revelation: see Thought of Thomas Aquinas. Outlawing usury did not prevent investment, but stipulated that in order for the investor to share in the profit he must share the risk. In short he must be a joint-venturer. Simply to invest the money and expect it to be returned regardless of the success of the venture was to make money simply by having money and not by taking any risk or by doing any work or by any effort or sacrifice at all, which is usury. St Thomas quotes Aristotle as saying that "to live by usury is exceedingly unnatural". Islam likewise condemns usury but allowed commerce (Al-Baqarah 2:275) - an alternative that suggests investment and sharing of profit and loss instead of sharing only profit through interests. Judaism condemns usury towards Jews, but allows it towards non-Jews. (Deut 23:19-20) St Thomas allows, however, charges for actual services provided. Thus a banker or credit-lender could charge for such actual work or effort as he did carry out e.g. any fair administrative charges. The Catholic Church, in a decree of the Fifth Council of the Lateran, expressly allowed such charges in respect of credit-unions run for the benefit of the poor known as "montes pietatis". In the 13th century Cardinal Hostiensis enumerated thirteen situations in which charging interest was not immoral. 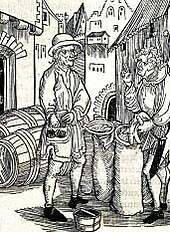 The most important of these was lucrum cessans (profits given up) which allowed for the lender to charge interest "to compensate him for profit foregone in investing the money himself." (Rothbard 1995, p. 46) This idea is very similar to opportunity cost. Many scholastic thinkers who argued for a ban on interest charges also argued for the legitimacy of lucrum cessans profits (e.g. Pierre Jean Olivi and St. Bernardino of Siena). However, Hostiensis' exceptions, including for lucrum cessans, were never accepted as official by the Roman Catholic Church. The Roman Catholic Church has always condemned usury, but in modern times, with the rise of capitalism and the disestablishment of the Catholic Church in majority Catholic countries, this prohibition on usury has not been enforced. The nature of the sin called usury has its proper place and origin in a loan contract… [which] demands, by its very nature, that one return to another only as much as he has received. The sin rests on the fact that sometimes the creditor desires more than he has given…, but any gain which exceeds the amount he gave is illicit and usurious. ^ "Definition of interest in English". English Oxford Living Dictionaries. Oxford University Press. Retrieved 27 December 2017. Money paid regularly at a particular rate for the use of money lent, or for delaying the repayment of a debt. ^ "Definition of dividend". Merriam Webster. Merriam Webster. Retrieved 27 December 2017. a share in a pro rata distribution (as of profits) to stockholders. ^ "Profit". Economics Online. Retrieved 27 December 2017. ^ O'Connor, J J. "The number e". MacTutor History of Mathematics. Retrieved 26 August 2012. ^ "How the world's first accountants counted on cuneiform". BBC World Service. 12 June 2017. ^ "A Simple Math Formula Is Basically Responsible For All Of Modern Civilization". Business Insider. 5 June 2013. ^ Gnuse, Robert (2011-08-05). You Shall Not Steal: Community and Property in the Biblical Tradition. Wipf and Stock Publishers. ISBN 9781610975803. ^ "Institute of Islamic Banking and Insurance - Prohibition of Interest". www.islamic-banking.com. Retrieved 2015-10-12. ^ a b Conrad Henry Moehlman (1934). The Christianization of Interest. Church History, 3, p 6. doi:10.2307/3161033. ^ Noonan, John T., Jr. 1993. "Development of Moral Doctrine." 54 Theological Stud. 662. ^ Bohm-Bawerk, E. (1884) Capital and Interest: A Critical History of Economic Theory. ^ Joseph Schumpeter, “History of economic analysis”. ^ Barbon, “A discourse of trade”, 1690; Schumpeter, op. cit. ; William Letwin, “Origins of Scientific Economics: English Economic Thought, 1660–1776”. ^ Schumpeter, op. cit. ; Massie, “Essay on the governing causes of the natural rate of interest”. ^ Schumpeter, op. cit. ; the references are to paragraph numbers in Turgot’s “Réflexions sur la formation et la distribution des richesses” written in 1766, first published in 1769-70 in a journal, and then separately in 1776. ^ Isolated remarks in the chapters “Effects of accumulation on profits and interest” and “On currency and banks” in “Principles of political economy and taxation”. ^ “Lectures on political economy”, IX. ^ “The rate of interest”, 1907. ^ “The general theory of employment, interest and money”, especially the appendix to Chapter 14. Page numbers refer to the widely available edition published by Macmillan for the Royal Economic Society as part of Keynes’s collected writings, which appear to correspond to those of the first edition. ^ “Of the rate of interest”, §1. ^ p135. Marshall called it the marginal utility of capital  and Fisher the rate of return over cost. Fisher also referred to it as representing the “investment opportunity side of interest theory”. ^ Keynes called this function the ‘schedule of the marginal efficiency of capital’ and also the ‘investment demand schedule’. ^ Étienne Mantoux, “Mr Keynes’ General Theory ”, Revue d'Économie Politique, 1937, tr. in Henry Hazlitt, “The critics of Keynesian economics”, 1960. ^ a b c d Rothbard, Murray N. (2001). Man, economy, and state : a treatise on economic principles (Rev ed.). Auburn, Alabama: Mises Institute. ISBN 0945466323. OCLC 47279566. ^ Unsourced observation in Schumpeter, op. cit. ^ O'Connor, J J; Robertson, E F. "The number e". MacTutor History of Mathematics. Archived from the original on 2008-08-28. ^ Robinson, George. "Interest-Free Loans in Judaism". Retrieved 12 March 2015. ^ "A Hebrew – English Bible According to the Masoretic Text and the JPS 1917 Edition". Retrieved 4 January 2013. ^ "Encyclopedia Judaica: Moneylending". Jewish Virtual Library. 2008. Retrieved October 16, 2017. ^ "IslamiCity.com - Mosque - The Prophet Muhammad's (PBUH) Last Sermon". www.islamicity.com. ^ Session Ten: On the reform of credit organisations (Montes pietatis). Fifth Lateran Council. Rome, Italy: Catholic Church. 4 May 1515. Retrieved 2008-04-05. ^ Roover, Raymond (Autumn 1967). "The Scholastics, Usury, and Foreign Exchang". Business History Review. The Business History Review, Vol. 41, No. 3. 41 (3): 257–271. doi:10.2307/3112192. JSTOR 3112192. ^ "Vix Pervenit - Papal Encyclicals". 1 November 1745.